Legend: SBC: Bangalore City Junction; KJM: Krishnarajapuram; CSTM: Mumbai CST; MAO: Madgaon; IGP: Igatpuri. 6530/29: Udyan Express; 0111/12 Konkankanya Express; 2533/34 Pushpak Express; 0103/04: Mandovi Express; LE: Light Engine. As per my observations, the loco keeps rotating in the same link only. 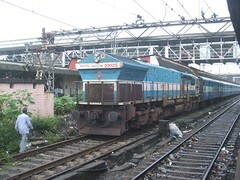 The locos that I have spotted till today (in Mumbai) are: 20012, 20013, 20016, 20021, 20022, 20023, 20025, 20026. Of these 20023, 20016 have been spotted many times. Seen in the picture above is 20025. I had spotted 20026 only once, and that was in early July. Since October 13, I have started loving these locos more - Reason: I will be travelling on Udyan Express on October 19th. So that would be my first journey on a WDP4 hauled train. That's it in this post. I am winding up early today - Have to prepare for an examination scheduled for tomorrow. Bye!